Both the script and idea development for my upcoming project are starting to come together. I’m not going to say much at this stage other than the working title for the piece is “Schrödinger’s Rabbit“. The class had script reads yesterday and I had the opportunity to run through my script (rev.2), no doubt there’ll be a few versions to come before it’s finalised. 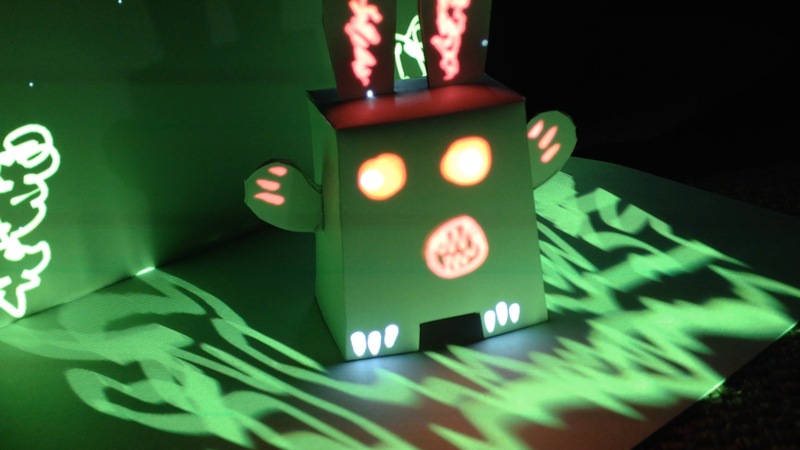 The piece is going to quite stylistic, it will be the combination of a pop-up book, animation and projection mapping. I have a backup plan to shoot this in a more traditional format if this doesn’t pan out well. The aim of the test you see above is to see if I could projection map an object which is no larger than an A4 sheet of card in the way I envisaged and sketched. 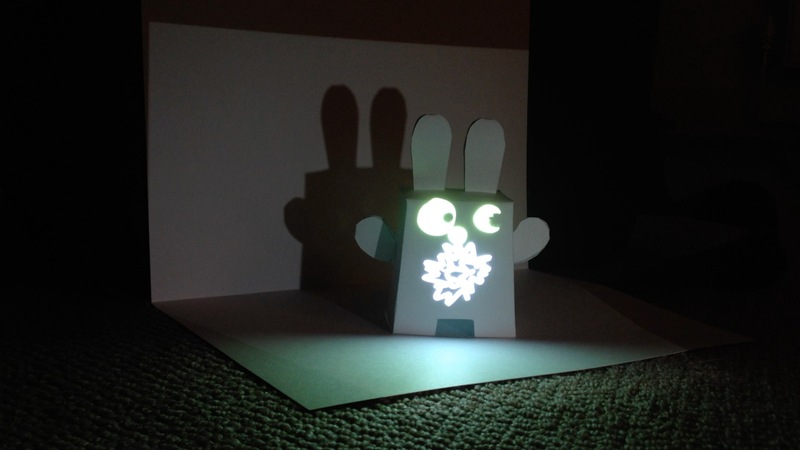 I have been very pleased with the results of the experiment despite only spending 15 mins on the projection and about an hour to create the card model rabbit. The project was inspired by a video I saw on TED talks that told the story of Nikola Tesla, I really liked the idea of a projection mapped pop-up book (http://www.ted.com/talks/marco_tempest_the_electric_rise_and_fall_of_nikola_tesla.html). I’m going to put my own spin and style on this technique. Other than the above talk,I’ve never seen the technique used to create a narrative short-film. I’ve been researching pop-up design and card mechanics. This is going to test my skills to the limit, combining animation, sound, film, story development and editing. Before taking this project too far down this road, I thought it best to test out the technique first to see if I could get it to work. I was a little pessimistic when setting it up, but the results exceeded my expectations. 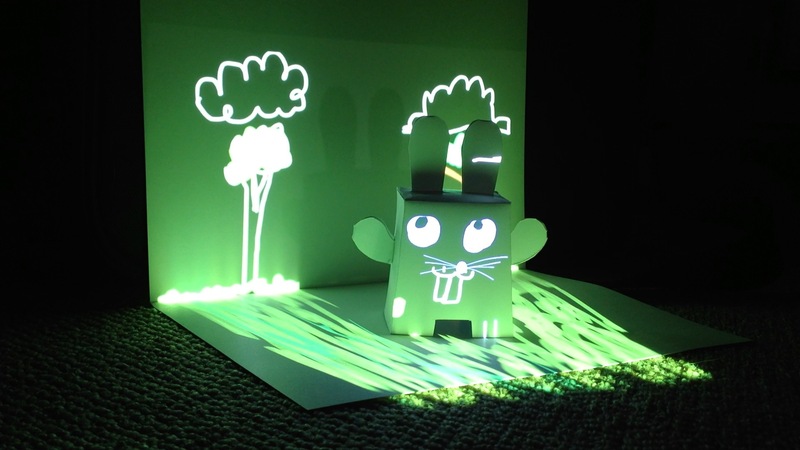 The animations are very simple and using a piece of software called Tagtool. Tagtool allows you to paint and animate live, and in a future blog post, I will explore the capabilities of the software. If you get a chance have a look at the website: http://tagtool.at for more info.